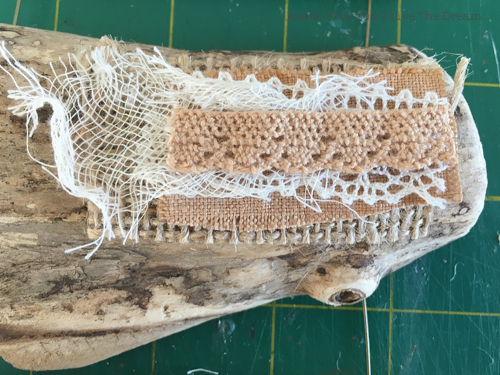 Hello fellow travellers, Jennie here again with you today sharing a step by step tutorial of how I created my Back to Nature challenge project. 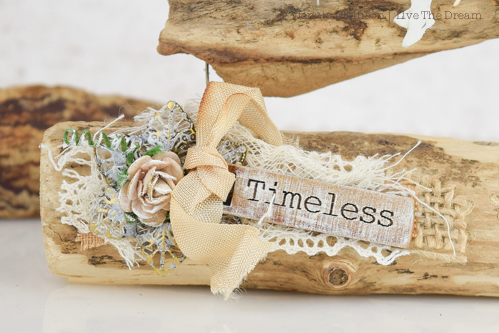 This month we are challenging you to use natural elements in your project - either using real items such as twigs, dried flowers, shells or pebbles, or stamps and stencils depicting natural elements. 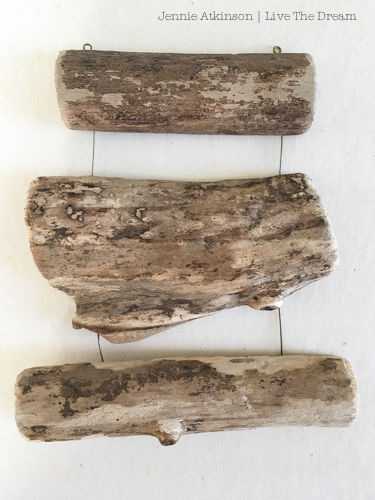 I decided to use some pieces of wood which I found in my husband's wood store (he's a woodturner and there are always "bits" lying around!). 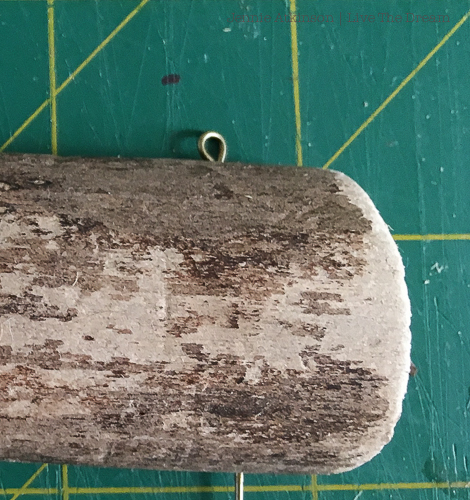 I spent some time trying to work out how I would put the wood together as a hanging and decided to use some fine metal jewellery pins which wouldn't dominate the wood which I wanted to be the main focus. On the reverse of the wood pieces I used a pencil to roughly find the point between the pieces where the pins would lie in a straight line and then measured and marked where I wanted the pins to go. 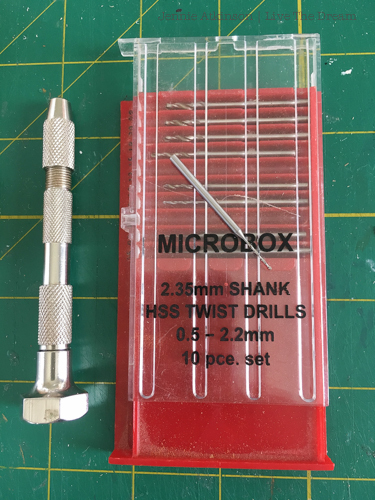 A number of years ago we invested in this small drill set (bought from Ebay) which has the tiniest of little drill pieces and a twist function to drill the hole. 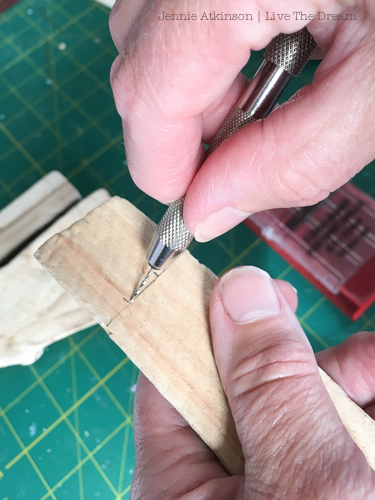 I have used it many times even on thick greyboard to create a fine hole. 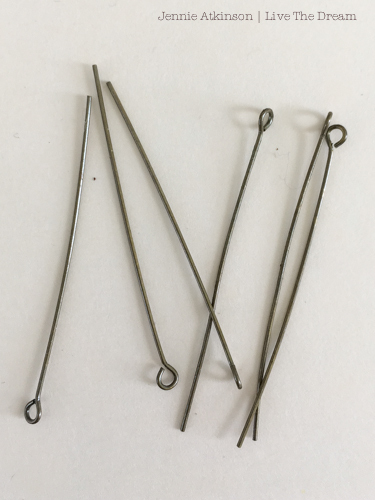 I wanted the holes to be at an angle so the pins wouldn't fall out so angled the point and then gently twisted to create the hole. All very easy and no brute force required! 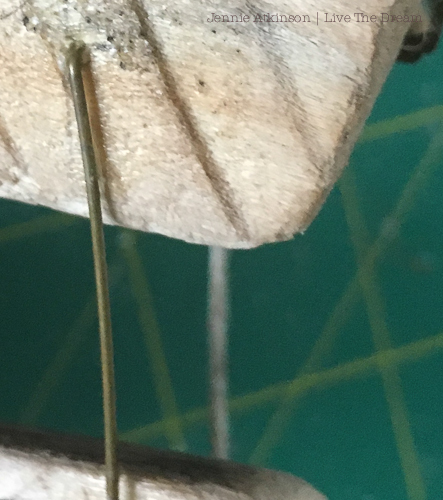 I then cut the eyelet from the top of the pin and then bent bent the wire slightly and "hooked" it into the hole adding a little PVA glue to hold it there. 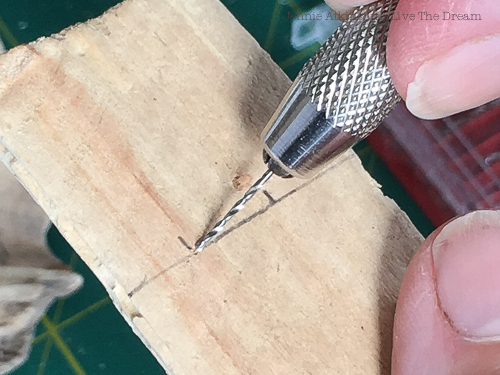 One pin was used from the bottom of one piece of wood to the top of the other. I had to wait for the glue on each pin to set before doing the next one. As added security I adhered some buckram tape. Not very pretty but it works well! For the top I used the eyelets on the top of the pin so I could add some string to hang my project. This is what the hanging looked like before I started decorating. 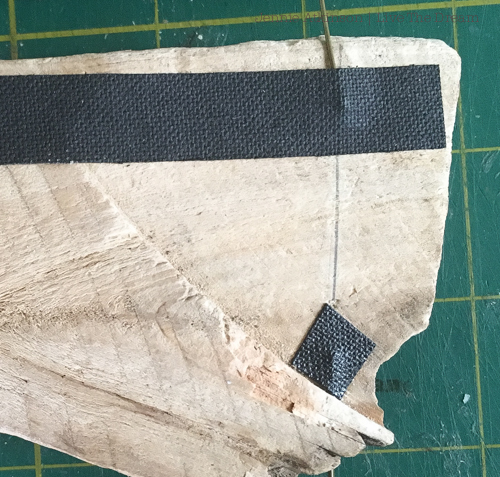 It's a bit wonky but I achieved what I wanted in that the wire does not dominate the wood pieces. 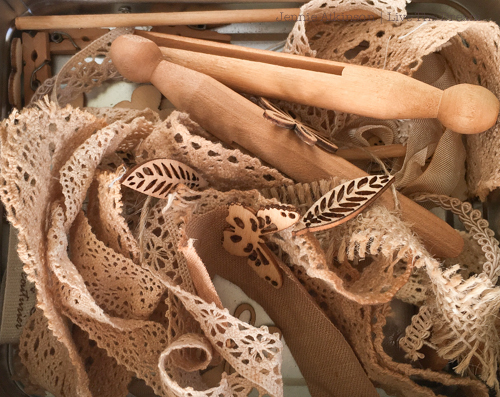 Every so often I make a huge pot of tea and soak various bits of lace, fabric, ribbon and woody bits. I love having a little tin of tea stained pieces that I can go to whenever I want. 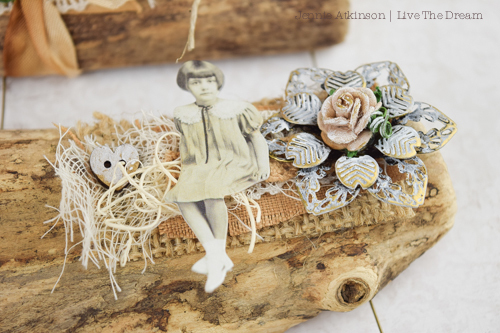 I thought a combination of the tea stained elements and white muslin would work well with the wood. 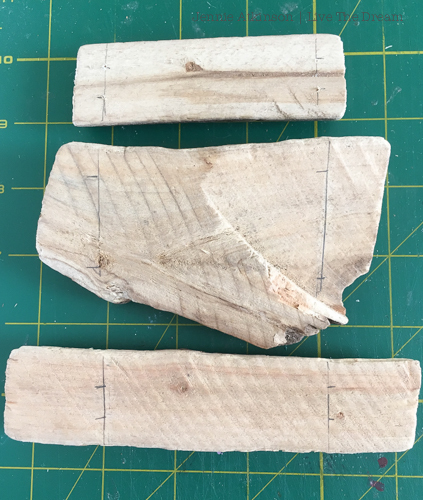 The wood pieces were quite thin and I didn't want to hide some of the lovely spalting, so I kept the decoration to a minimum. I just kept experimenting to see what worked. Once everything was stuck down I dry brushed gesso over the metal to tone it down and also over the wooden embellishments and flowers. I love the way the gesso unifies everything. Thank you so much for joining me for this mid challenge tutorial. 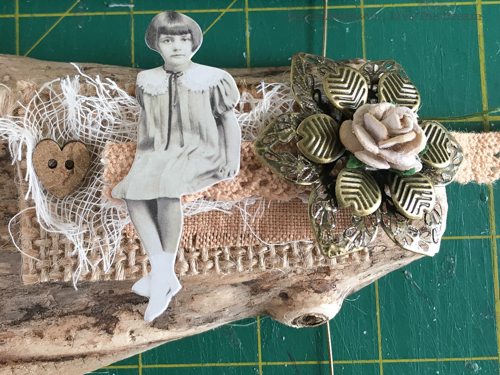 You still have plenty of time to join in our challenge and you can get all the details HERE along with some fabulous inspiration from the Creative Guides. You have until the 4 October to link your project and we always look forward to seeing what you create. 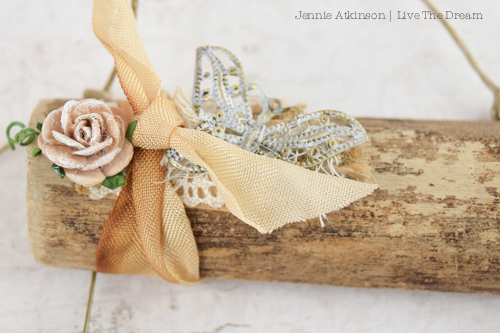 A great tutorial for your gorgeous hanging, Jennie. I have to say, I think the slight wonkiness adds to the charm. Lovely to see the tools creating the magic behind the scenes - and it's not the first time I've envied you a wood-turning husband! Fabulous post, thank you. 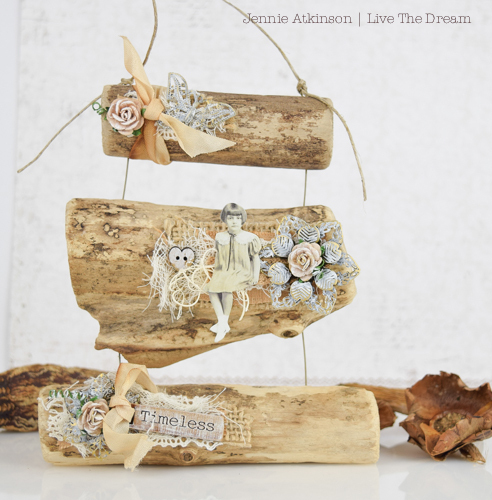 This is such an inspired project Jennie, I loved it when the challenge went live, it takes the theme to a whole new level! A fantastic tutorial and so cleverly put together!! My goodness this is amazing!! Definitely messing with the idea, hope to find as much success with design as yourself! Thoroughly enjoyed reading your tutorial, Jennie . Great to see you 'working the pins'. Love how you have accentuated the natural beauty of the wood in your embelishments. This is a real treasure.